Jobs and shops at struggling fashion chain Bonmarché are under threat after UK billionaire Philip Day tabled a takeover bid. The deal values the Yorkshire-based chain, which began in 1982 and now has 312 shops specialising in clothing for the over-50s, at around £5.7m. Edinburgh Woollen Mill Group owner Mr Day warned he expected a “material reduction” in headcount at the chain. Bonmarché employs 1,900 full-time equivalent people, its website says. The struggling retailer warned last month that trading had deteriorated, adding that it expected to lose £5-£6m this year. Using his Dubai-based investment vehicle Spectre, Mr Day has bought another stake in Bonmarché and now holds a 52.4% of the retailer. As he now owns more than half of the company’s shares, this has triggered a mandatory takeover bid. However, the offer of just 11.445p a share is well below Monday’s closing price of 18p. Mr Day said he would do a “store-by-store profitability assessment” with the aim of closing underperforming shops unless it was possible to implement “reduced rents, staff reductions or other cost saving measures”. He added he was “well positioned to provide advice, guidance and support to secure the long term future of the Bonmarché business, its stores and employees”. If the deal goes ahead, the company would become private and the shares delisted. The businessman started his career at clothing manufacturers Coats Viyella and Wensum before eventually taking over Edinburgh Woollen Mill. Through Edinburgh Woollen Mill, Mr Day has bought several clothing chains, including discount chain Peacocks and the upmarket Austin Reed and Jaeger brands. Bonmarché has not commented so far on the offer. 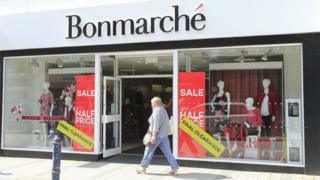 Maureen Hinton, retail research director at GlobalData, said it was “an excellent result for Bonmarché”. She said that while the offer “must be a relief for management”, the low price being offered was “not such a relief” for shareholders given that the shares stood at about 120p last summer. 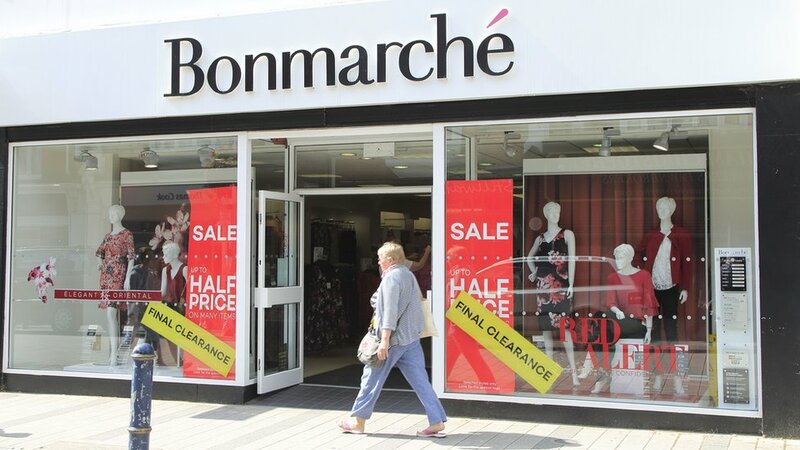 Bonmarché is one of a string of well-known names suffering in a tough High Street environment. Last year, Poundworld, Toys R Us and Maplin all went bust and disappeared altogether. Other household names – Homebase, Mothercare, Carpetright and New Look – were forced into restructuring deals with their landlords, closing hundreds of stores.